Buying a used caravan is a big commitment. Not only is it a major financial investment, but it also marks the beginning of an exciting new chapter of your life. As such, selecting which caravan to buy is a decision that should not be made lightly. Rather, it requires a significant amount of research and preparation. This is particularly true for people buying a caravan for the first time. With so many factors to weigh up, it’s easy to get overwhelmed. Consequently, it can be hard to know if you’re making an informed, practical decision and purchasing a caravan that’s right for you. However, this decision-making frenzy shouldn’t detract from your overall experience. After all, buying a caravan should be a fun, exciting, and rewarding process. So, to help ease the stress and allow you to make a confident, informed decision, we’ve put together this caravan buying guide. It’s full of handy checklists and tips for buying a caravan for the first time. Covering everything from what questions to ask, to what to bring along to the inspection, we’ve thought of it all, so all you have to do is buckle up and enjoy your caravan! Buying a used caravan requires plenty of research. As much as we wish it could simply be a case of buying the caravan and getting straight to the fun part, unfortunately, research is unavoidable. In fact, that’s probably why you’re here. If so, congratulations, you’re part way there! To get the ball rolling on your used caravan research, it’s important to ask yourself one simple question: why do you want to buy a caravan? Don’t worry, it’s not a trick question. Will it be for family use, or are you hoping to take a solo trip? Do you plan to use it all the time, or just a couple of times per year? Your answer to these questions should inform all of your subsequent research. For example, a smaller caravan probably won’t be suitable for family trips, while a caravan with a few more kilometres under its belt might not be suitable for rugged adventures. 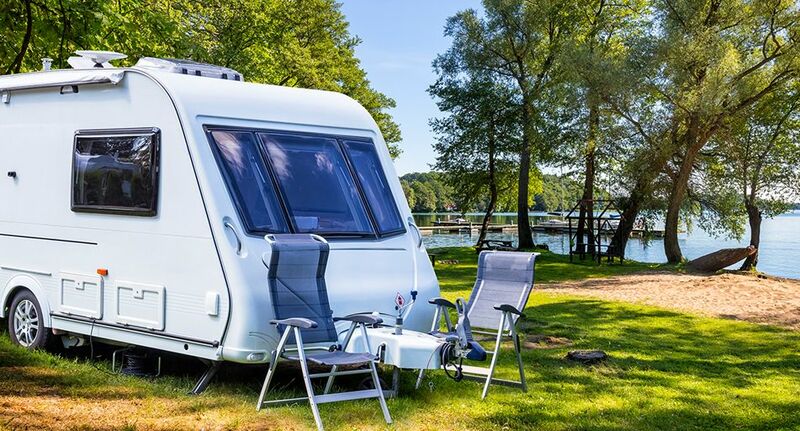 Basically, the intended purpose of your caravan can greatly impact what you end up buying, so it’s important to have a clear set of parameters in mind. Once you’re crystal clear on the reasons that you want to buy a caravan, it’s time to start drilling into more specific research. Naturally, there are heaps of sites that sell used caravans, so we suggest setting aside an afternoon to browse through, eliminate any options that definitely won’t suit your needs, and create a shortlist of suitable options. Once you have this shortlist, it’s time to move onto step two. Once you’re satisfied all of these things are in order, it’s time to move on to the interior. Check for any discolouration/dents on the walls, roof, cabinets, etc. You’ve checked the caravan inside and out and are satisfied that it’s up to scratch. Obviously, if you’re purchasing a used caravan, you might have to compromise on some of the above factors depending on the asking price and your specific needs. Still, you should never compromise on anything that might risk your safety. Further, things like rust and water damage can be expensive to repair, so you should take this into consideration before making your final purchasing decision. How old is the caravan? Has the caravan had any previous owners? Where has the caravan been driven in the past? Where has the caravan primarily been kept (i.e. undercover or outside)? Are spare parts still available for this make/model of caravan? If after all this you’re still satisfied, then it’s finally time to get to the fun part: buying the caravan and enjoying the awesome perks of being a caravan owner!